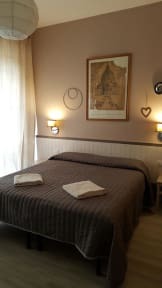 Good value hostel, close to the train station & centre Florence. Great little guest house. Perfect if you're looking for a private room on a backpacker budget. Walking distance from everything. Short walk from the station and easy to find. Very Nice place, but the Internet was broken so I would rather have them let me know about it before I booked. Great facilities very close to the main train station. Fully recommended. close to the train. quiet. it was good for what it was. nothing spectacular, but served its purpose. snacks available for breakfast. i would stay here again. The main problem with this guesthouse is the smell ! There may be a problem with the drains , but the smell was overwhelming and powerful in the bathroom. Although the owner tried to message the manager of the building , the smell seemed to linger. Also there was no sight of any fridge despite being told that there was a fridge and microwave for our comvinence. Nice place, right near the main train station. Check in was easy, the place was newly updated and in good condition. Good sized room, mini fridge and lots of closet space. 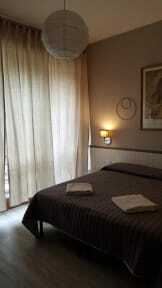 Good value option in Florence with a/c (a major bonus in Italy! ), plus a large clean room. Located on a main road but close to the train station and main sights, and the street noise is not bad at all. However, our main gripe was the construction work going on on floors above - it was very, very loud during the daytime. Also, wifi didn't work properly. Checking in was confusing. Paying with card nearly impossible as the POS machine had no instructions and was in Italian. Bed was super uncomfortable, construction outside and hammering on nearby floors was loud from 7AM-6PM. Woke up one morning to doors propped open and unlatched. As the staff is never there it made me feel unsafe. Other guests were unfriendly/rude.